One of the most popular Croatian food (well, at least around Zagreb and maybe not so much in the sea side) is Pljeskavica, which is also widely eaten in the former Yugoslav countries. Pljeskavica uses various minced meat, such as chicken minced meat, beef minced meat, pork minced meat and so on. But in Bosnia, which is an Islamic country, the pork meat is not used for any food including Pljeskavica. If you look for a good Pljeskavica restaurant, I would recommend the Grill Pub Grana near the Lake Jarun. 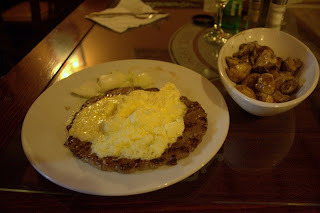 When you order a Pljeskavica, usually you will also have non-cooked onion, cheese or Kajmak (sour cream cheese) and Lepinja. Lepinja is a type of bread slightly baked with meat oil of Pljeskavica. The price of Pljeskavica including the onion, the cheese or Kajmak, and the Lepinja is only 35 Kn. 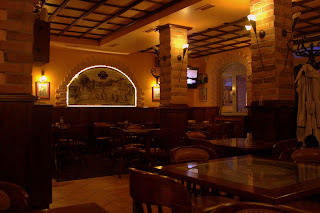 The Grill Pub Grana is located a bit far away from the centre of Zagreb. To get there, you need to take tram No. 5 or 17 and stop at Petrovaradinska station, which is the third station from the last. You can check the detailed map on the website of the restaurant by clicking "Naša Lokacija". Also, you can check their menu by clicking "Jelovnik". The opening hours of the restaurant is from 9:00 to 23:00.